In Site Gallery, Printed in Norfolk provided the focus for ‘print it’, a summer celebration of artists books, which included a residency by Sheffield writers’ collective COPY and a pop-up international artists’ bookshop including works by some excellent Yorkshire-based book artists. Printed in Norfolk at Site Gallery received the accolade “timely and inspiring” from Robert Clarke of The Guardian. With the help of COPY and the team at Site the exhibition and Coracle Press also generated lots of coverage on social media – of which more to follow soon. In the mean time, here is a favourite blog by creative art museum interpretation professional and PhD researcher Alexandra Woodall. 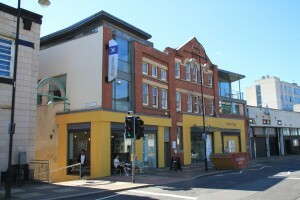 Site Gallery is Sheffield’s flagship international contemporary art centre. Located in the city’s cultural industries quarter it has a truly great in-house café, Site Canteen and is at the heart of Sheffield’s dynamic visual arts scene.